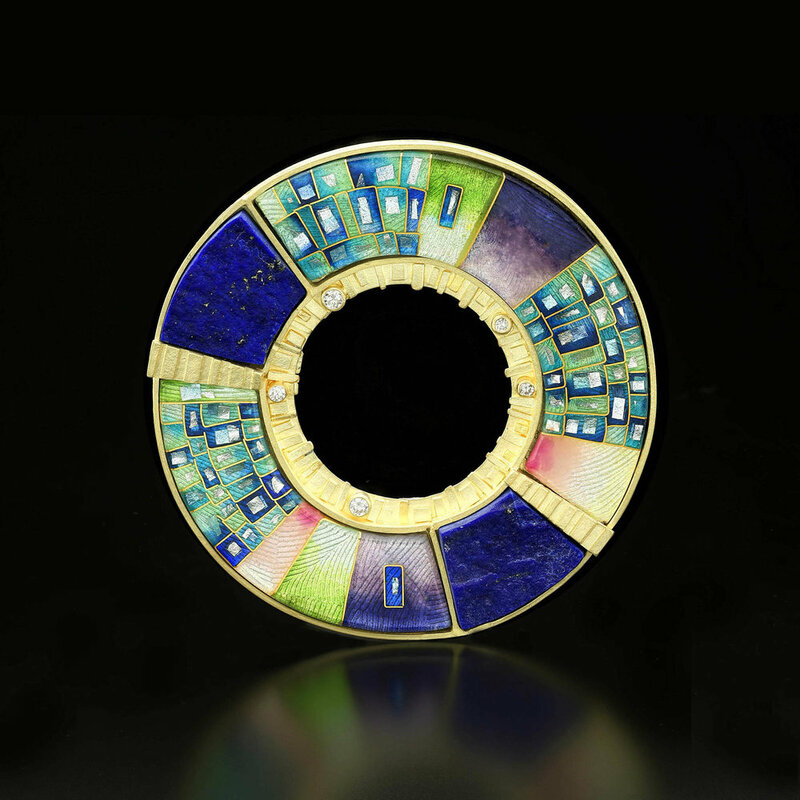 Amy Roper Lyons masterfully combines enameling techniques such as cloisonné with traditional goldsmithing techniques such as fusing and forming. At the point in her career where she primarily sells one-of-a-kind pieces directly to private clients, she is constantly experimenting with her work. Amy's jewelry has been exhibited nationally at museums, galleries and craft shows, including the Smithsonian Craft Show. She lives in New Jersey, about 45 minutes from New York City, and teaches workshops on jewelry and enameling across the country. This is her third Saul Bell Design Award. MARLENE RICHEY: TELL US ABOUT YOUR WINNING PIECE, "ORBIT #2." AMY ROPER LYONS: Orbit #2 is part of a series I am currently working on. The series is inspired by photos of outer space taken by the Hubble Telescope. I have always been inspired by the natural world. Five to ten years ago I was doing very representational work based on animals, insects and plants. Imagery of the circle is a central element of Orbit #2. The circle is a powerful symbol, which signifies woman, motherhood, the cycle of life, things dying in the fall and being reborn in the spring. It has often been an inspiration for me. It is important to me because I first make the piece and then acknowledge all the things that intuitively come together and make sense afterwards. Inlaid lapis pieces have been carved to specific shapes in my piece. And I use 18K gold and 24K gold wires in the enamel, which is traditional for cloisonné. MR: WHAT ARE THE PROCESSES YOU USED? ARL: The piece is fabricated and enameled. I set the diamonds as well as setting the lapis in a bezel. I am a bit of a perfectionist, therefore I do all of it myself. I know how I want things done. ARL: I learn from every piece. "If only I could start this piece over again" is something that we all think. If I had this opportunity, I would approach it a little differently. Getting the lapis to fit exactly was a challenge. I would have done that first then made the enamel parts. MR: WHAT ARE THE DIMENSIONS OF THE PIECE? ARL: 1.75" across. I wanted something that was a statement piece. Orbit #1 was a lot smaller but I wanted something that was more bold. MR: WHAT DO YOU LIKE MOST ABOUT ORBIT #2? ARL: I think all the different elements come together so beautifully, the gold work, enameling and stones. It is simple and not complex or ornate. There is an elegance to the piece. MR: WILL YOU TO SELL IT? ARL: I sell everything. There are a few pieces that haven't sold for one reason or another. My work has changed radically over the years, and there is nothing to put with some individual pieces left from a specific collection. I love it when people buy my work. It means so much to me that someone else wants to buy it. One of my favorite parts is the connection to the people who buy my work. I started selling in the 1980s making sterling and bone jewelry. I went to a wholesale butcher to purchase bones to use in my work. At that time I was very inspired by historical traditions—Japanese, African and Muslim work. I exhibited at a lot of craft shows in the '80s and sold my work in galleries. I don't sell wholesale anymore, and my work is all one-of-a-kind. My materials have changed from silver to gold, enamel and gemstones, putting the work in a different price category. These days I mostly sell directly to private clients. ARL: When I was a kid my mother took a jewelry class and made a ring for me. Since that moment I was fascinated with the idea that someone could shape metal. It seemed so hard and unmovable. I took a class at a local art center and was immediately hooked. My grandfather was a jeweler on 47th Street in New York City, and he made beautiful gold cigarette cases and lighters that sold at Tiffany's. He didn't want me to go into the business. However, he did leave me his tools, so he came around in the end. It took me many years before I knew what to do with some of them. ARL: After I have been out to a conference on the arts or to a museum. I find those get me excited and make me want to go back into my studio and work. I do a lot of teaching, and I always learn from my students. I love to take classes as well, even if it is something I don't expect to use. Sometimes things unintentionally influence my work because of exposure to new techniques and approaches. As jewelers we spend a lot of time alone; we need to get out more with other people who share our passion. MR: WHAT IS THE ONE THING YOU MOST LOVE ABOUT YOUR STUDIO? ARL: My studio is two stories high. Even though it is in the basement, it has huge windows and skylights, which I love. It is full of art, paintings on the wall and pictures of things that inspire me. Insects. Shells. Seahorses. Beach stones. MR: WHAT IS YOUR FAVORITE TOOL? ARL: My favorite tool changes from time to time but the micrometer I got from my grandfather is really special. It measures things precisely. I love this tool. Another favorite is a steel stake for metals might that belonged to Richard Reinhardt, one of my professors from art school. It is dear to me because I think of him every time I use it. ARL: Try to be true to yourself in your art. Don't be influenced by all the trends. And never stop learning. It makes life exciting to continually learn. MR: WITH WHAT DESIGNER WOULD YOU LIKE TO HAVE DINNER? ARL: Daniel Brush, he makes amazing steel and gold boxes and sculpture. Another person is Joe Arthur Rosenthal, known as JAR, whose atelier is in Paris. I saw his work at the Metropolitan Museum in New York City. It was amazing. You can see more of Amy's work at amyroperlyons.com.